If the deal is concluded, Russian experts predict the emergence of a very successful and interesting product on the military aviation market. The new aircraft will be modeled on Russia’s fourth-generation MiG-29 jet fighter, and experts believe it will find demand on the global market. Russia and the United Arab Emirates will create a lightweight fifth-generation fighter based on the ultra-maneuverable MiG-29. This project will be the two countries’ first joint project in military aviation. Sergei Chemezov, head of Rostec, the Russian state defense company, told Defense News that the aircraft will be manufactured in the UAE. Later, Russia will hand over the technology for making the fifth-generation fighter, together with the license. The aircraft’s development is scheduled for 2018, and production will begin in the mid-2020s. Can the U.S. foil these plans? Experts point out that Russia's plans in the UAE are at odds with the interests of other major weapon-producing nations, primarily the U.S.
"A similar situation occurred in 1995 when the UAE was going to buy the Russian Su-35 fighters, but then suddenly all contacts ceased after our public announcement of the impending deal; the Americans had managed to lobby for their F-16s on more favorable terms for the UAE," said Konstantin Makiyenko, deputy head of the Center for Strategy and Technology Analysis. Gazeta.ru, citing an anonymous source in the aviation industry, warns there is a risk that events may take a similar turn, because while there's an agreement between Moscow and Abu Dhabi, no contract has yet been signed. Other experts, however, are more optimistic. Pavel Bulat, head of the Mechanics and Energy Systems International laboratory at the University of Information Technologies, said the UAE’s choice in favor of Russia to develop the fifth-generation aircraft was obvious. "The American F-35 aircraft was available only to those countries that participated in its development from the beginning, and that's why Japan couldn’t get these aircraft, but Israel could," said Bulat. If the deal is concluded, Russian experts predict the emergence of a very successful and interesting product on the military aviation market that will be available for anyone to buy. “The MiG-29 is currently the best aircraft in the lightweight fighter class, and the issue of what it will look like has already been resolved," Bulat said. “What remains to be done is to address the future fighter’s stealth qualities in line with new generation requirements, and to create an engine that will allow it to develop a cruising speed during supersonic flights." The future aircraft will be able to reach Mach 1.6, depending on the terrain over which the aircraft will fly. 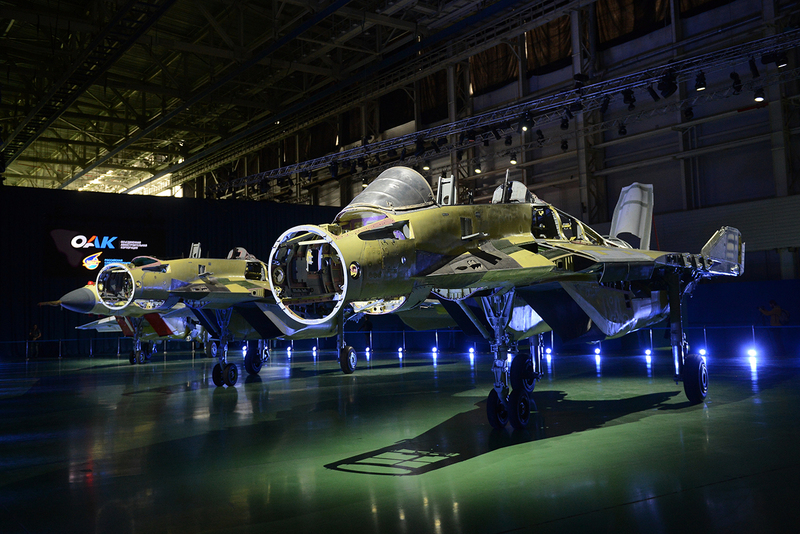 "In terms of armaments, the fighter will inherit this from another Russian fifth-generation fighter aircraft, the T-50, and will be equipped with the 9-A1-4071K cannon, one of the lightest in its class," said Bulat. In addition, it will also have air-to-air and air-to-surface missiles, and will carry conventional bombs with a total payload of 5 tons. The future aircraft’s takeoff weight will be from 15 to 18 tons.